Since 1989, PNHP staff have been conducting inventories of the ecological resources in each county of the Commonwealth. Nearing the completion of the first round of inventories, a new phase of CNHIs is beginning. Read more about county inventories. The Rare Plant Forum is a function of the Vascular Plant Technical Committee of the Pennsylvania Biological Survey, and for over twenty-five years has served in an advisory role to the Commonwealth of Pennsylvania for issues related to the conservation of the native flora of Pennsylvania. In addition to discussing proposed changes to the list of Plants of Special Concern in Pennsylvania (POSCIP), there are usually a few related presentations. Read more about the Pennsylvania Rare Plant Forum. Bryophytes (mosses, liverworts, and hornworts) and lichens grow in many different habitats in close association with their substrates. This species/substrate relationship results in sensitivity to changes at the microclimatic level. Taking the cue from recent research, we are comparing the bryophyte and lichen diversity in forested areas receiving different levels of disturbance with Miller Run Natural Area in north central Pennsylvania. The goals of the project are to determine differences in bryophyte and lichen diversity and identify potential species indicators of high quality forest habitats. Submerged aquatic vegetation (SAV) refers to a group of plants that grow entirely underwater; although some may have additional floating leaves. These plants have important ecological roles in aquatic systems. Dense patches of aquatic plants provide protection for small juvenile fish and serve as an attachment surface for snails and other invertebrates, while decomposing SAV provides a food source for bottom-dwelling organisms. SAV beds also reduce turbidity by slowing the flow of water which allows sediment to settle out, and their roots help stabilize the substrate. PNHP staff mapped SAV in the upper Delaware River for the National Park Service, revisiting many of the same sites that were documented in the early 1990s. The results of the work will help the Park Service as well as others involved in the management of the basin to assess the health of the river. The Pennsylvania Game Lands Management Tool (PGLMT) is an interagency effort to improve management planning for rare, threatened, and endangered species on Pennsylvania’s State Game Lands. For this project, PNHP has collected new data for populations of state listed plants and animals on state game lands and prepared management plans for these species. We have also mapped ecologically important habitats for state and federally listed species on state game lands. When completed, this tool will streamline and simplify conservation planning by balancing the habitat management goals of PGC with the conservation needs of Pennsylvania’s rare, threatened, and endangered species. Northeastern bulrush (Scirpus ancistrochaetus) is a federally and state endangered plant that grows in vernal pools throughout the central and eastern sections of the state. Pennsylvania represents a stronghold for this plant species since the majority of all known locations are found within the Commonwealth. To assess the health of the populations within Pennsylvania, PNHP biologists are working with the U.S. Fish and Wildlife Service and DCNR to monitor Scirpus populations and to study the genetics of those populations to better understand the diversity of the species throughout its range in the northeastern United States. The Pennsylvania Bureau of Forestry (BOF) owns and manages over 2.2 million acres of land in the state. Although a great deal of information concerning rare species and natural communities exist for BOF lands, there are still many areas that have not been surveyed. Additionally, there are many older records for plant and animal populations that need to be updated. 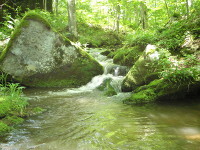 Much of our work has focused on the large forests of north central Pennsylvania, particularly in the regions experiencing development pressure from the natural gas industry, where species like the timber rattlesnake and northern water shrew are particularly abundant but in need of greater survey, This information will aid the Bureau in effectively managing the state forest system for multiple uses while taking into account some of the state’s most unique plant and animal resources. One of Pennsylvania’s rare violets, the great-spurred violet (Viola selkirkii), is associated with rich forests in northern Pennsylvania. 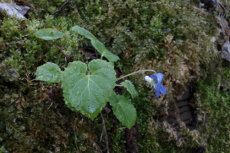 PNHP has undertaken a project to better understand the relationship of great-spurred violet to the specific natural communities and environmental conditions with which it is associated. We hope to expand the records we have for great-spurred violet and to use information from habitat assessments to improve conservation planning for this species. 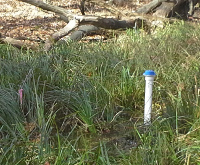 PNHP has begun an EPA-funded study to describe and document the vegetation and natural communities associated with riparian areas of headwater streams across the state. The riparian zone is the transition area between where a stream channel ends and terrestrial communities begin. Native plants that grow in riparian areas along waterways protect the stream bank from erosion, regulate water temperatures, and provide food and shelter for a variety of wildlife both in and along the stream. These areas can be damaged by disturbances that occur near streams or within the upper watersheds where headwater streams are found. Information from this study will be used to update the natural plant community classification and assist DEP with mitigation strategies. PNHP aquatic ecologists are surveying the Delaware River basin for two endangered mussel species; the state endangered eastern pearlshell (Margaritifera margaritifera) and the federally endangered dwarf wedgemussel (Alasmidonta heterodon). The eastern pearlshell can live 100 years or more in typically small, coldwater streams that support brown trout and other salmonids. Pennsylvania waters are thought to be the southern-most extent of its range in North America. The dwarf wedgemussel also prefers cool, clean waters in North American east coast streams. Characteristics that make dwarf wedgemussel vulnerable to threats include a relatively short life span (about 12 years), low rates of reproduction, and limited dispersal. Eastern pearlshell and dwarf wedgemussel have both seen dramatic declines from their historic populations. In an effort to discover previously unknown populations, this project will inventory potential habitats in the Delaware River basin to better understand the distribution of these two rare mussels in Pennsylvania.